Discover last year's finest...with the best eBooks of 2008! Valentine's Day the most romantic day of the year...so show yourself some love by indulging in the best Valentine eBooks of 2008! 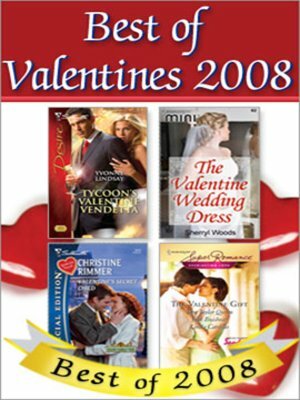 Bundle includes Tycoon's Valentine Vendetta by Yvonne Lindsay; The Valentine Gift by Tara Taylor Quinn, Jean Brashear, and Linda Cardillo; Valentine's Secret Child by Christine Rimmer; and, as a free bonus, The Valentine Wedding Dress by Sherryl Woods.